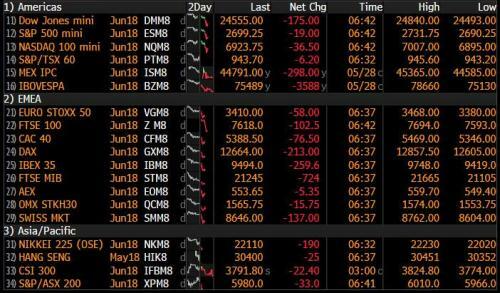 Commenting on today’s sheer market chaos as the US and UK return from holiday, Bloomberg writes that “fixed-income markets have descended into panic amid mounting concern over the risk of Italy leaving the euro or leading to its break-up” and while Italy is suffering the biggest losses in peripheral debt, core bonds and Treasuries are spiking higher. For those who stayed away from market news over the holiday weekend, this is what happened and why we are here today: Italy PM-designate Conte gave up on efforts of forming a government after Italian President Mattarella rejected Eurosceptic Paolo Savona for the Economy Minister position because the appointment would have “alarmed markets and investors, Italians and foreigners” (yes, very ironic in retrospect, although just as we predicted would happen). Mattarella then summoned former-IMF senior director Cottarelli to meet in a move viewed by some as laying the groundwork for a technocratic government. Forza Italia said they would not support this government, and 5SM and League set their sights on the now highly likely new elections (touted from September 9th). Both 5SM and League saying they will evaluate their coalition in these new elections. At the same time, the Spanish Parliament started the process for a no confidence vote against PM Rajoy, while it set the date for debate and vote of confidence on PM Rajoy’s government for May 31st and June 1st. But what is different this time, is that while the risk-off sentiment is spreading across risk assets around the world, with Italy and Spain leading declines in European stocks and U.S. equity-index futures also sliding amid soaring contagion fears, with the euro also slammed below 1.16 pushing the yen and USD higher along with gold, it is unclear just what the ECB can do this time, which back in 2012 unleashed the threat of “whatever it takes” to halt the last Italian collapse. Well this time, “whetever it takes” has been running non stop since July 2012, and the ECB is rapidly running out of bonds to monetize, so it may well be that we are finally approaching the end of the European experiment, unless of course Draghi gets a greenlight from Merkel to start monetizing everything – stocks, bonds, and anything else that is not nailed down – in hopes of stabilizing markets. And before it is all over, he will, just as Europe will file criminal charges against those who dare to short Italian bonds. For now, however, as we showed earlier, Italian bonds are crashing with 2Y yields plunging the most on record, Italian-German spreads exploding, Deutsche Bank stock tumbling below €10 for the first time since September 2016, and Italian bank CDS blowing out. … with Italian banks now in a bear market. As Italian banks continue to bleed, trading has been periodically halted in Monte Paschi (-4.5%), Bper (-5.4%) and Banca Generali (-3.0%); all limit down. … while the Stoxx 600 has fallen to an almost four-week low and is again trading below the level at the start of the year. In fact, all major European benchmarks are also now in the red for 2018, except France’s CAC 40. Even more important, the declining euro isn’t acting as a cushion for exporter-heavy indexes like the DAX, which is also heavily in the red today. In short, everyone is only focused on one thing: Italy’s domestic politics. As a reminder, Italian President Mattarella yesterday gave a futile mandate to ex-IMF official Cottarelli to form a technocratic government. Cottarelli’s list of Ministers is expected to be unveiled today, moving the process to a vote in the Italian parliament (League, 5 Star and Forza Italia have majority) where a snap election – now also dubbed a Euro referendum – appears inevitable. The question now is what the ECB will do: not only how will Draghi stem this outright liquidation of everything Italian, but whether the ECB’s tapering plans are now indefinitely postponed, and/or whether it is time for even more QE. … the yen rallied against all G10 peers with USDJPY dropping to a one-month low; the Swiss franc was the other top performers while the U.S. 10-year yield fell to the lowest level in almost seven weeks as it played catchup to the sharp rally in Treasuries futures over the holiday. In light of Europe’s repeat crisis, it is probably not a surprise that Gold is currently trading higher and has broken the USD 1,300/oz level as safe-haven demand is proving some support for the yellow metal. Copper prices are seeing strength after the closure of an Indian copper smelter is cutting supply to the market. Steel rebar is higher as Chinese seasonal demand has grown. Looking at the day ahead, in Europe we’ve got April money supply data for the Euro area and the May consumer confidence reading in France due. The ECB’s Villeroy is also due to speak again, followed by the ECB’s Visco, Mersch, Lautenschlaeger and Coeure. In the afternoon the main highlight in the US will be the May consumer confidence report, while the May Dallas Fed manufacturing activity index and March S&P/Case-Shiller home price index data are also due. Away from that, the OECD conference is also due to kick off (through to Thursday).